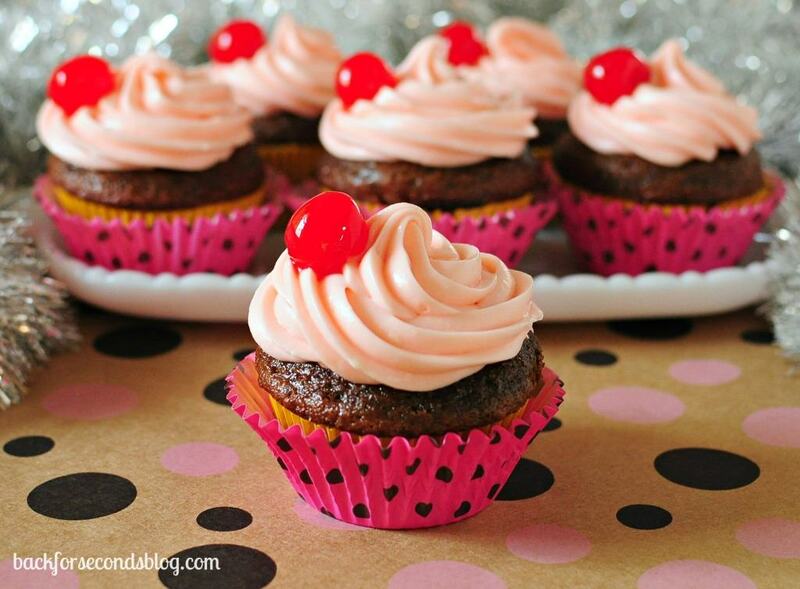 Moist and fluffy cherry chocolate cupcakes topped with a cherry cream cheese frosting. Lip smacking good!! In a large bowl beat together butter, mayo, and sugars until smooth. Add in the cocoa and cherry juice and mix well. Add the salt, eggs, and milk and mix until well combined. Gradually add in the soda, baking powder, and flour. Once combined mix on high for one minute. Place 24 liners into cupcake pans and fill with cake batter 2/3 of the way. Bake about 14 minutes or until toothpick inserted into cake comes out clean. Let cool on racks completely before frosting. Beat butter and cream cheese until smooth. Add in powdered sugar and beat really well. Pour in cherry juice one TBS at a time and continue beating until it reaches the desired consistency. Pipe onto cooled cupcakes. Top each cupcake with a cherry. I made these last weekend for a friend’s daughters bday party. I did not personally eat one but she enjoyed a lot! She said these were chocolatey and moist! Thanks for the recipe. Can you clarify the flour to use. I assumed it was 1 3/4 cups and the space didn’t occur. I baked these today, can’t wait to try them. I did notice that the centers dropped while cooling, has anyone else had this problem? ?